Here is how to enable FreeRTOS to use multiple memory blocks for a virtual combined memory heap, giving you access to non-contiguous memory regions. For example, an NPX Kinetis K64F has 256KByte of SRAM, but the biggest memory object or array I can use is only 192 KBytes. How is that? So, how do you use more than one-half of the memory? FreeRTOS has the solution with the Heap_5 memory scheme. FreeRTOS offers different memory management schemes, and one of them is heap_5. "This scheme ... allows the heap to span multiple non adjacent (non-contiguous) memory regions. " The above reserves one block of 50 KByte and one block of 128 KByte. 'No-init' means that the startup code will not initialize the variable/RAM inside that section (see GNU Linker, can you NOT Initialize my Variable?). Initialization of heap memory is not needed, and it only would slow down the startup of the program. NULL, 0 // << Terminates the array. That table lists the regions, starting with the lower address block. Each entry has a pointer to the start of the memory block and its size. The list is terminated by a NULL sentinel. vPortDefineHeapRegions(xHeapRegions); // Pass the array into vPortDefineHeapRegions(). Must be called first! 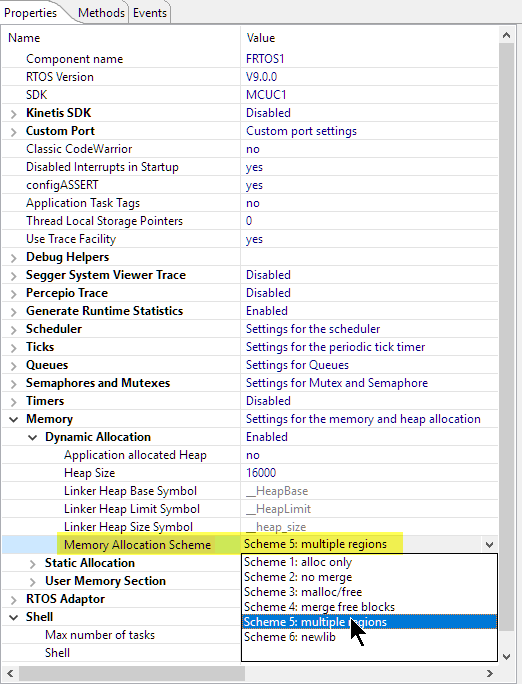 The important thing is that this has to be called before any FreeRTOS memory allocation (task, semaphore, mutex, queue, ...) is performed! I usually call it right after main() is called. The memory is still divided into pieces, but the total amount of memory available is now the sum of the pieces. Of course, memory is still fragmented, and this defines the largest piece of memory I can allocate. Using the heap_5 allows me to use a FreeRTOS heap to span multiple memory regions: exactly what I need for devices which have multiple RAM memory controllers or that have gaps between the SRAM regions. With heap_5, I still cannot have single objects larger than the largest memory region, but it allows me to use multiple non-contiguous areas in a safe way. I have posted the example project used in this article on GitHub. How not to initialize variables: GNU Linker, can you NOT Initialize my Variable?